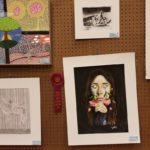 A few pictures of the award winning entries at the BAA Student Art Show. Amazing work from artists across western North Dakota from pre-school to grade 12. 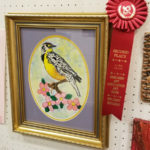 -Best of Show – Dafne Hafen, “Golden Retriever.” Badlands Arts Student Art Show. 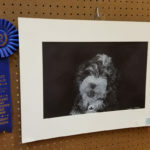 1st Place – Sophia Mettler, Grade 10, “My Dog.” Badlands Arts Student Art Show. 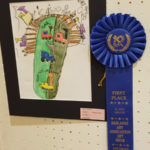 2nd Place – Kylee Rose Sickler, Grade 3, “Dakota.” Badlands Arts Student Art Show. Display of artworks from grades 8 to 12. 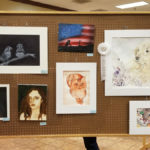 Badlands Arts Student Art Show. 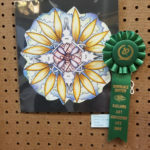 Honorable Mention – Jaqueline Herald, Grade 11, “Mandala.” Badlands Arts Student Art Show. 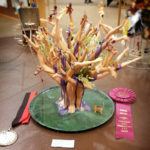 Most Innovative – Dafne Hafen, Tree of Life. 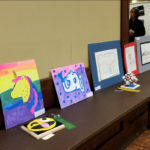 Badlands Arts Student Art Show. Artworks from pre-school to 3rd grade. 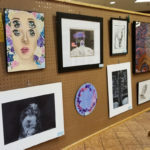 Badlands Arts Student Art Show. 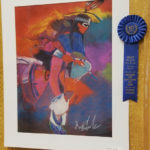 1st Place – Scheeler Maxwell, Grade 8, “Spirit Dancer.” Badlands Arts Student Art Show. 1st Place – Caisson Lies, “Train Face (alias Face in Training)” Badlands Arts Student Art Show. 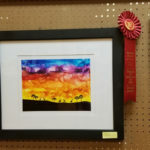 2nd Place – Mary Jane Mayer, Grade 8, “Serengeti.” Badlands Arts Student Art Show. 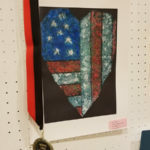 Austin Rosler Memorial Award to Piper Rodney, 1st Grade, “Heart Flag.” BAA 2018 Student Art Show.